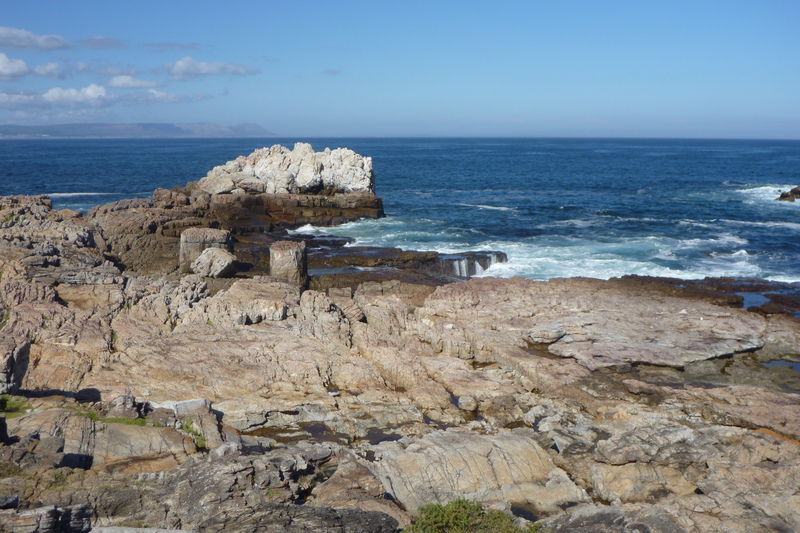 Tearing ourselves away from the delicious enclave of Franschhoek, we continued driving towards Cape Town with a slight detour to check out the nearby whale capital of Hermanus. This is the bay where hundreds of whales settle between June and November to court, mate, and birth. The town is so well known for the whales that there’s even a town crier whose job it is to roam around with chalkboard and bullhorn, directing everyone’s attention to the right spot. We were one month before the beginning of whale season, but I thought it was still worth a try. Nope. No whales here. No sharks, no seals… no town crier. We were alone. At least the rocks were interesting, fun to scramble around, part of a 7-mile cliff walk along the shore. We kept hearing a screeching sound and assumed it was seagulls, then noticed something scuttling around our feet. 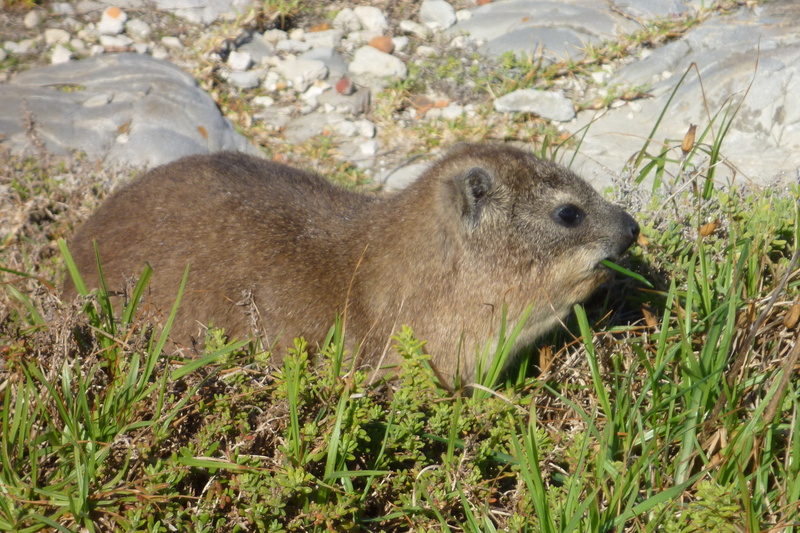 There were Rock Hyraxes everywhere! I guess we weren’t entirely alone. 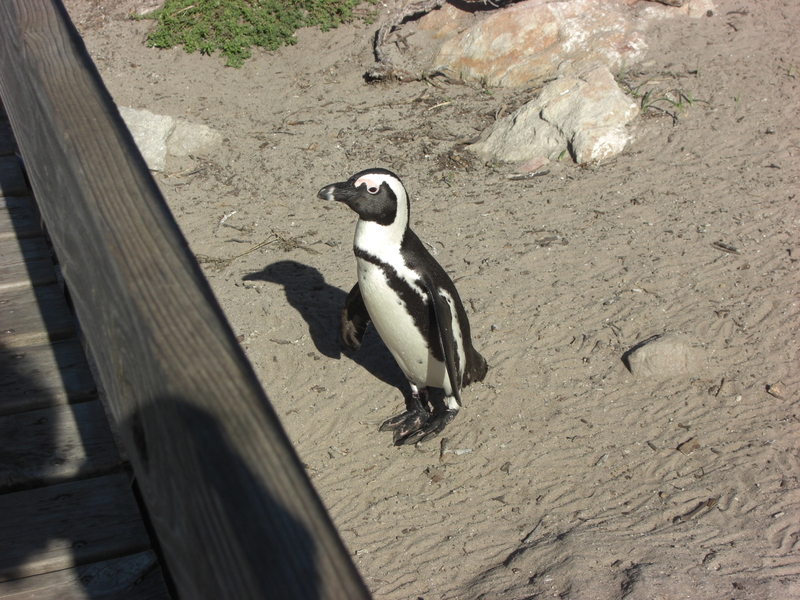 Driving a little farther on, we stopped at a place called Stony Point at Betty’s Bay, one of only three mainland colonies for the endangered African penguin. These colonies are special (for us tourists, anyway) because otherwise the penguins stay on small offshore islands, making them harder to see! 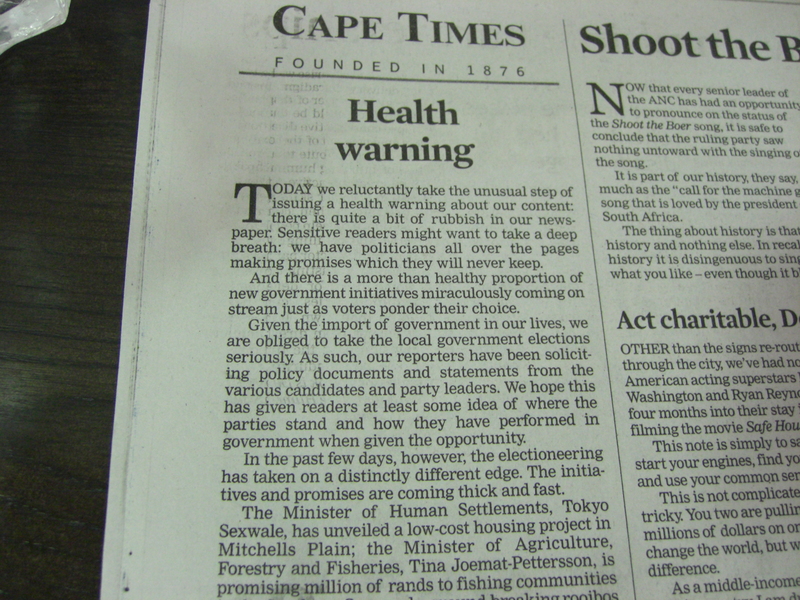 In June 2000 there was a large oil spill near Cape Town. 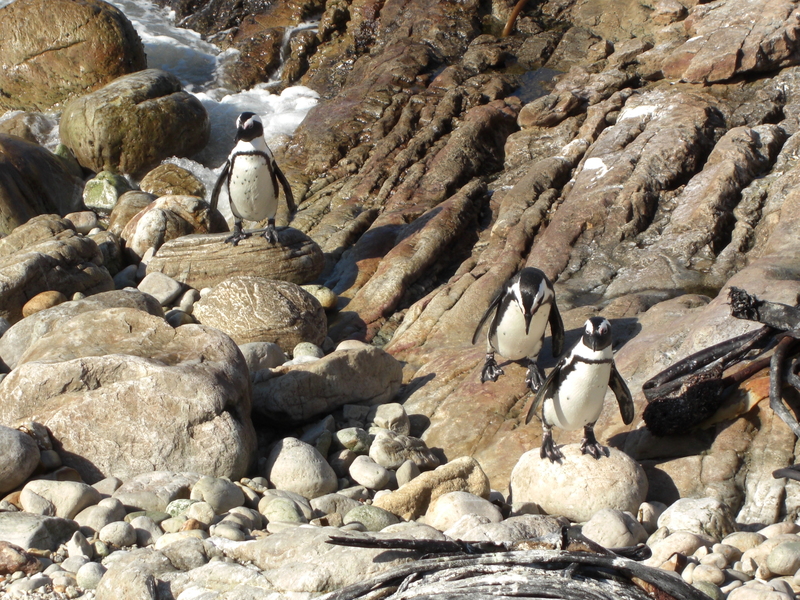 Thousands of penguins were airlifted from the affected islands and trucked 800km away to Port Elizabeth, then released. They instinctively swam “home,” back to Cape Town, arriving 10-20 days later, just as the last of the oil from the sunken tanker was removed. Pretty cool. Time to get back on the road. 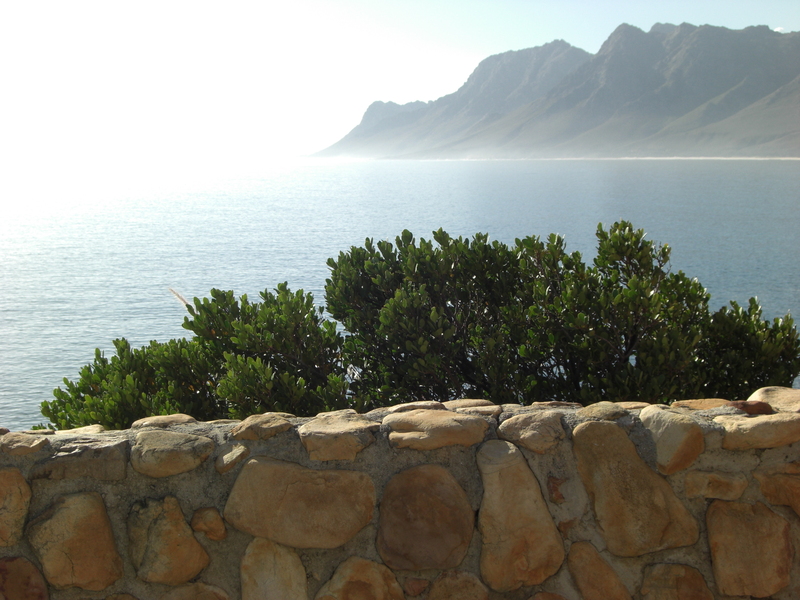 We drove north along the coast to reach Cape Town. Beautiful views, excellent roads… felt like we could have been driving the Pacific Coast Highway on our way to San Francisco. We had put a lot of effort into choosing the right neighborhood and hotel for our stay in the city. 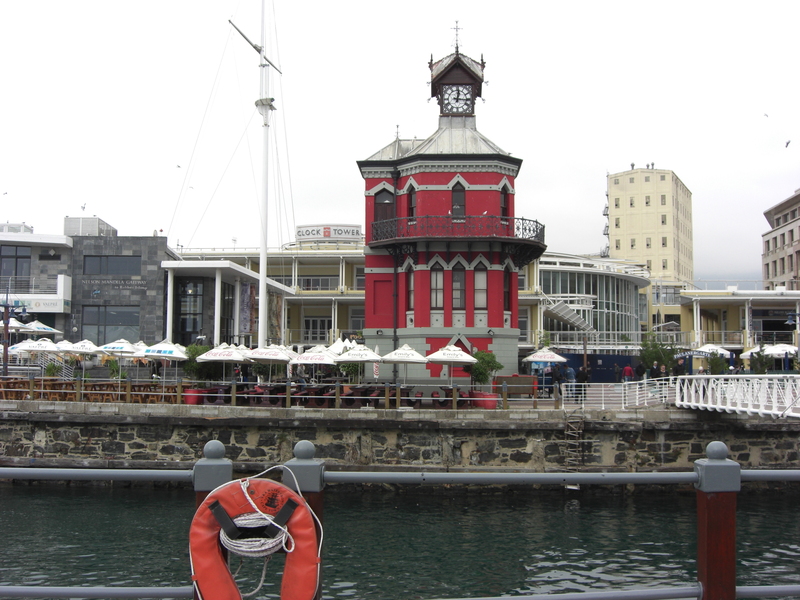 Most of our friends who’d been there recommended we stay on the Victoria & Alfred Waterfront. It’s the main tourist district, with lots of lovely (and expensive) hotels, restaurants, and shopping. But we wanted to stay someplace less… well, touristy. (Think Nob Hill versus Fisherman’s Wharf.) But we had to consider the safety aspects as well. With the help of TripAdvisor we found the perfect place, and were very happy with it. 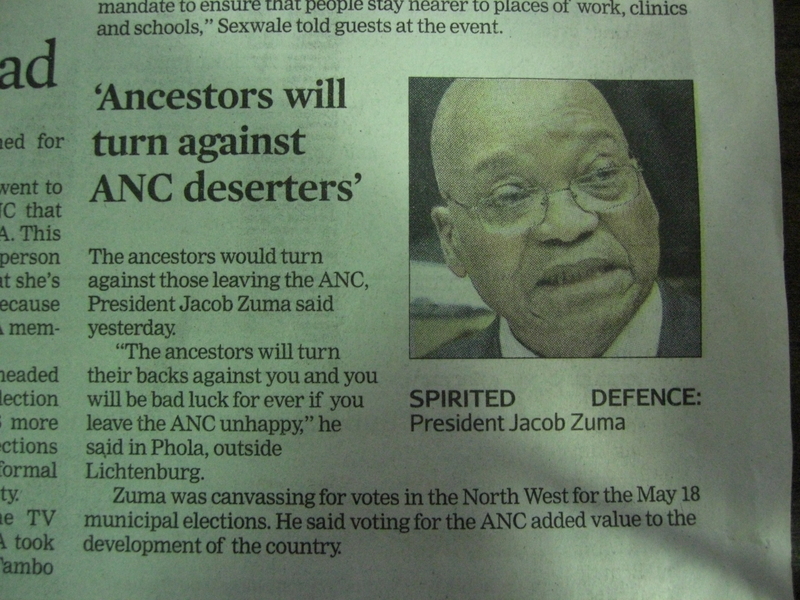 It was a small guest house called An African Villa in a neighborhood called Tamboerskloof. Reviewers said it was safe and there were great local restaurants within walking distance, even walkable at night as long as you didn’t stray from the main drag. So we booked it, and we loved it. For the next 3 nights we settled in and got to feel the rhythm of the place. Our first evening there, we had just enough time to relax after the long drive, enjoying a welcome glass of champagne in the room, before walking down the street to Hudsons Burger Joint for dinner. 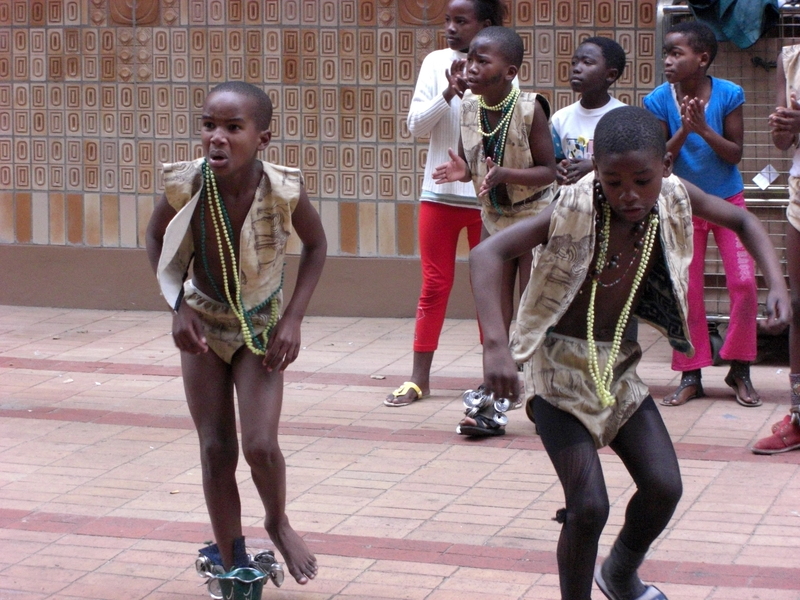 They describe themselves as “an integral part of trend-setting Cape Town culture.” I’ll say. I felt just slightly old being around all these hipsters, yet sorta cooler at the same time. If that’s possible. 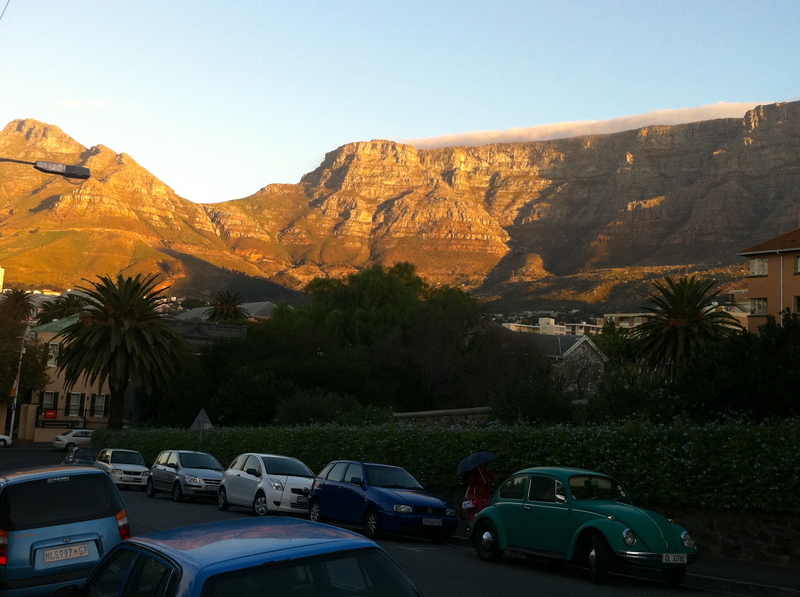 The hotel sits in the shadow of Table Mountain, surrounded in fact by mountains on all sides. (Another plus over the waterfront!) 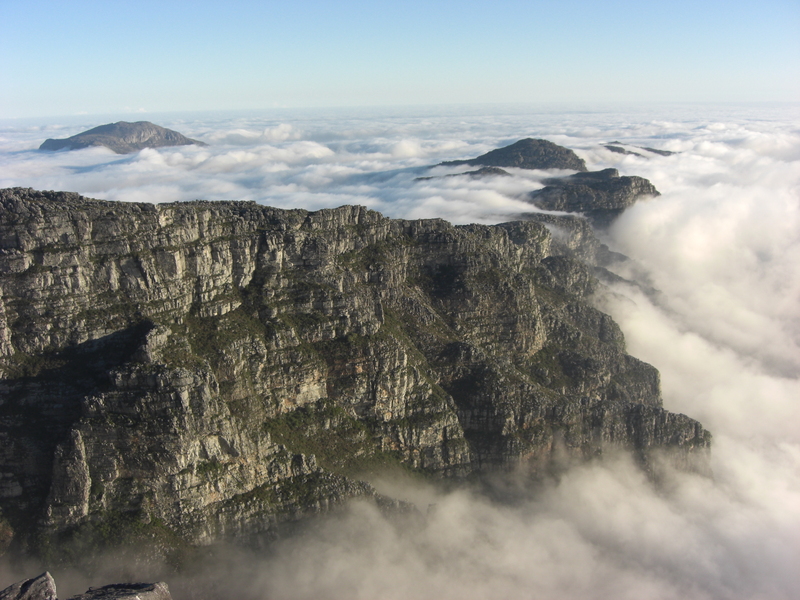 Table Mountain is so-named because it is flat-topped, like a table, but also because of the notorious cloud cover that settles over it like a tablecloth. This happened to be the only non-cloudy view we got of it the whole time. 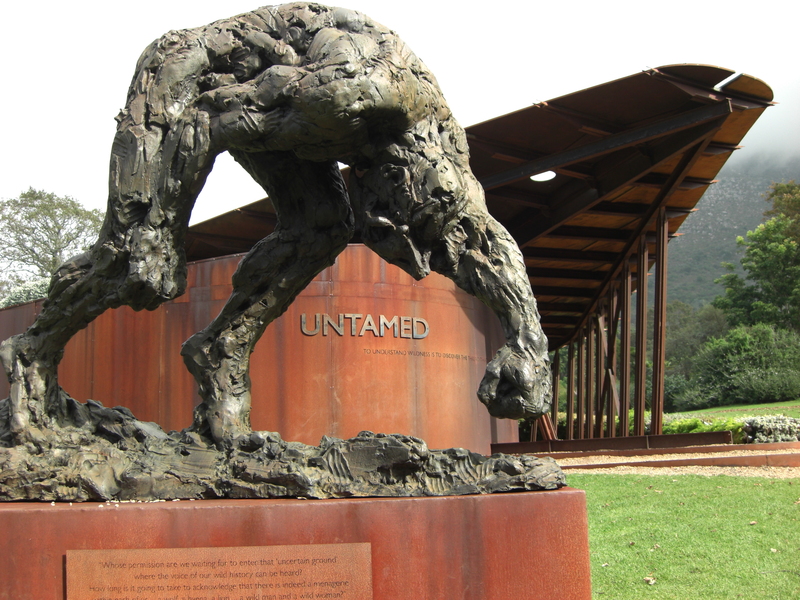 The guidebooks say when this happens, run, don’t walk, to the cableway to climb up on top. But we were hungry and those burgers were calling. The next morning, after another incredible array of exotic fruits (and more) for breakfast, we headed for the nearest CitySightseeing bus stop. A little touristy, yes, but such a great way to get our bearings in a big city and learn a lot about it at the same time. 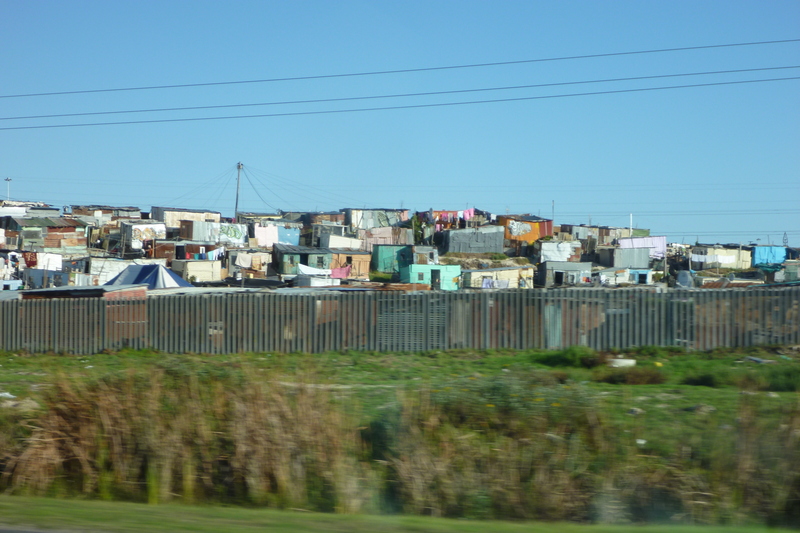 We drove past District Six, an area declared “whites-only” under apartheid, forcing the removal of over 60,000 minorities to less desirable parts of town. We drove past the Rhodes Memorial and the beautiful University of Cape Town. 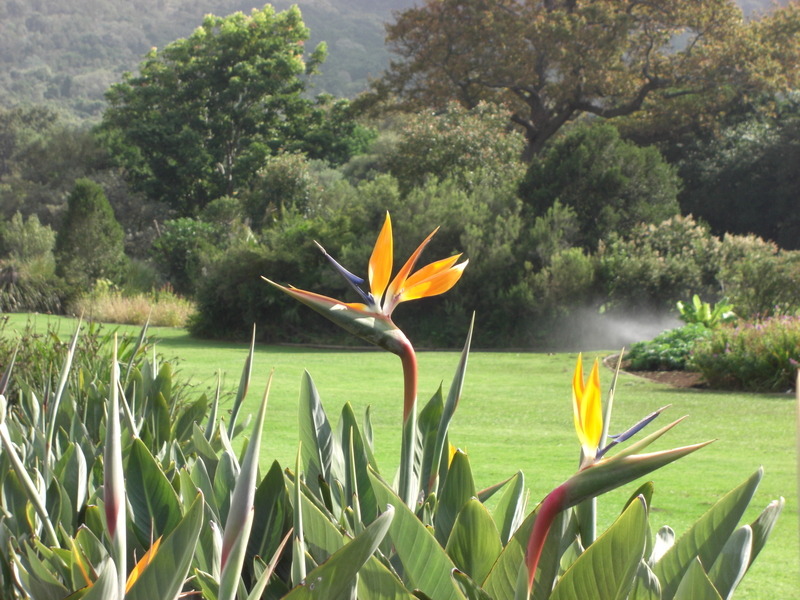 We got off at the next stop, Kirstenbosch Gardens. This is one of the most famous botanical gardens in the world, no way am I going to miss it! 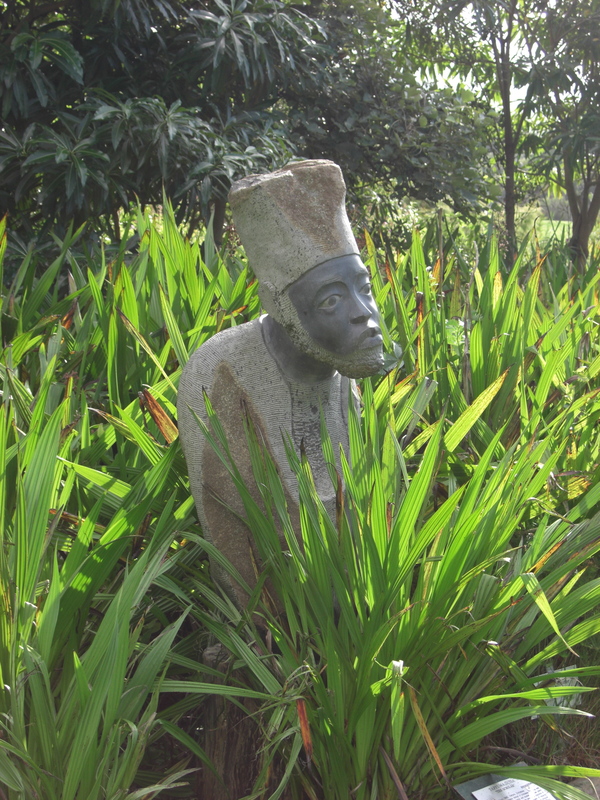 It was founded in 1913 with the express purpose of protecting the country’s indigenous flora — the world’s first garden to do so. 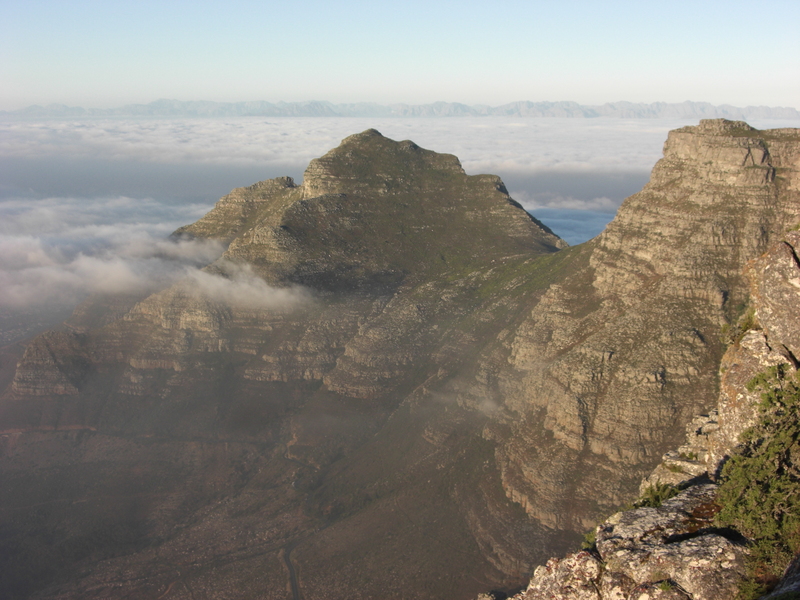 And the fynbos of South Africa is incredibly unique. 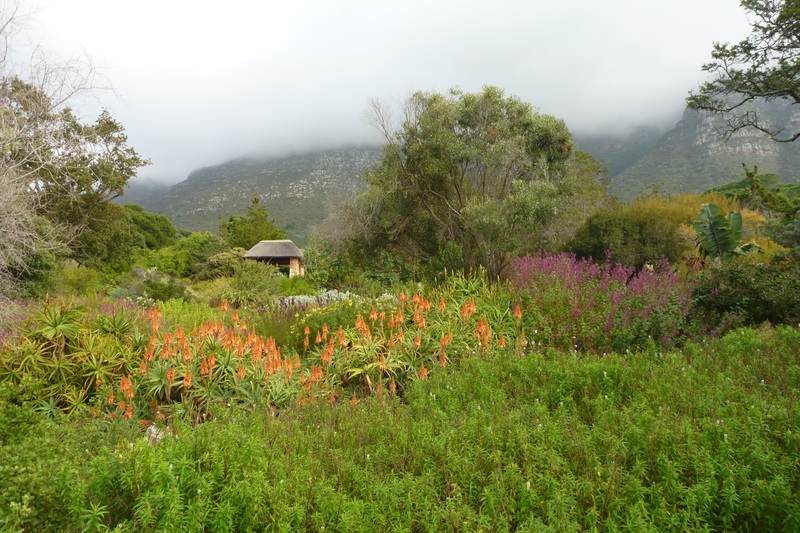 The gardens were stunning, tucked up against Table Mountain. Even if it was a cloudy, gray day, and not anywhere close to the spring blooming season. Breathless from literally jogging through the huge park, trying to see as much as possible in a short time, we jumped back on the bus and drove through Constantia wine region (beautiful), past parks called World of Birds and Monkey Jungle, and then past a township called Imizamo Yethu, which offered a tour called “the township experience.” I begged Seb to go. I’m intrigued by the townships, curious, and eager to drop some rand on anyone making a living out there (tour guide, artisan, food vendor, etc. ), when it’s far easier to fall into crime. 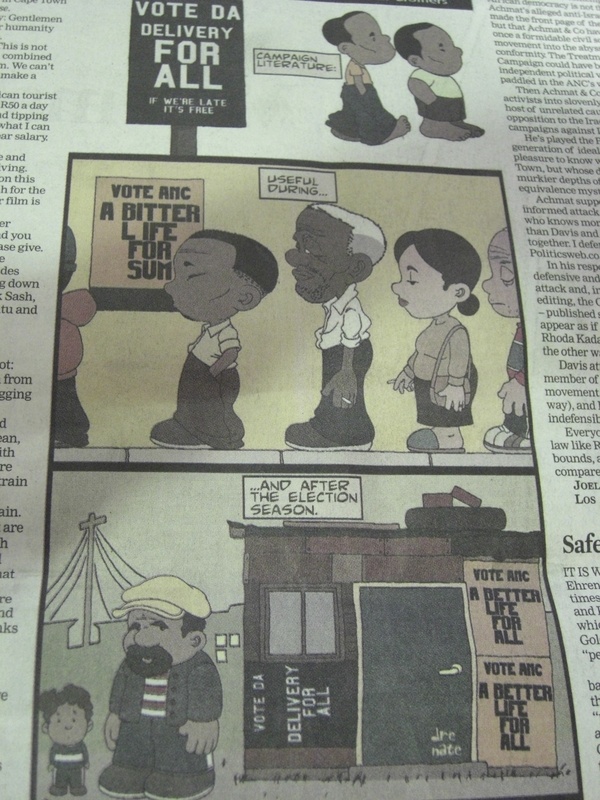 The townships are pretty shocking. They are super crowded and lack the proper infrastructure for sewer, clean water, and electricity. 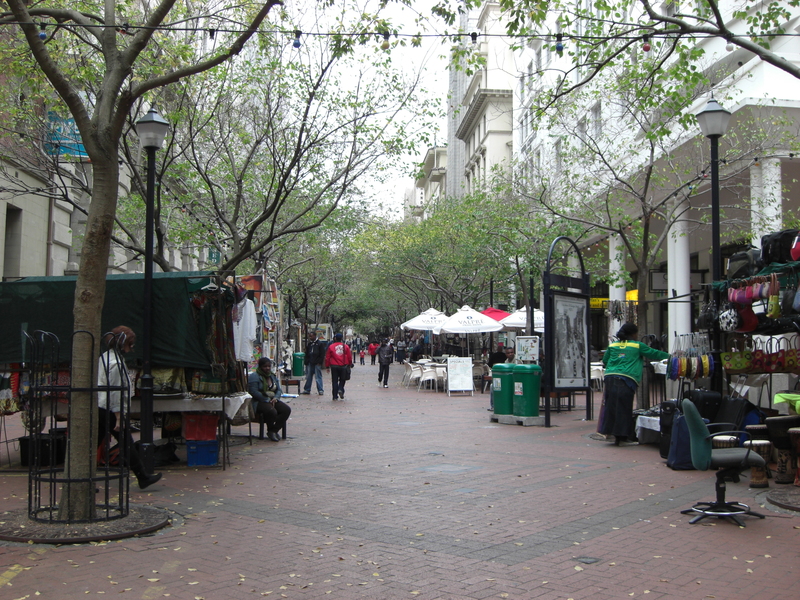 And they are so… well, segregated, physically cut off from the rest of the city, which is spacious, beautiful, modern. Seb and I always disagree about this topic, what he calls “human tourism” and I call “human interest.” Luckily for him, the opportunity to get off the bus passes us by while we’re still debating. 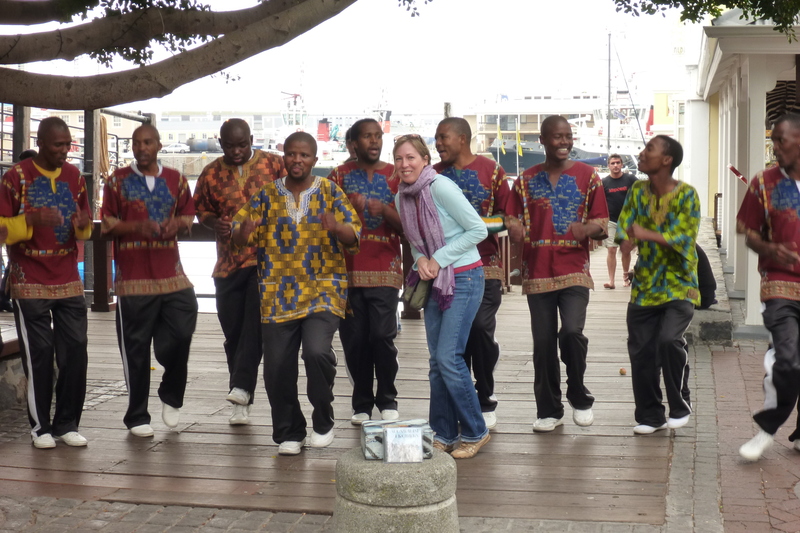 We press on to Hout Bay, hop off the bus and chow down on some seafood at a kitschy place called Mariners Wharf. Hout Bay has a funny claim to fame in that they declared themselves a Republic and created their own passports in the late 1980s. Some say this was just a publicity stunt for a local Rotary/Lions Club project, others say it was an anti-apartheid statement. Either way, the story goes that some people were able to travel successfully with these fake passports, one guy even claiming to go halfway around the world, without immigration officials noticing (or caring) that it wasn’t a real nation. Back on the bus. We pass beautiful bays, one after another, until they blend together, and finally say good-bye to the bus when it hits downtown. We walk around a bit before the sun goes down, since this is a place considered off-limits at night. We admire some old buildings, museums, and churches from the sidewalk, some shops and restaurants too. We head back to Tamboerskloof on foot, stopping at a tiny place called Mozzarella Bar for dinner. The chef is from Italy and makes homemade mozzarella, delicious mozzarella. We had a trio of mozzarella, three types paired with three pestos. We had a caprese salad. We had white wine. It was everything we could have wanted. Then we took the chocolate fondant. We began wishing we lived here. The next morning we slept in a bit, took a late breakfast at a nearby cafe, then walked back downtown and on through to the famous waterfront. Later that afternoon, we met up with friends Sharon and Gerhard for high tea at the Mount Nelson Hotel. Very posh! So nice of them to meet us, and fun that we’re all in town at the same time. 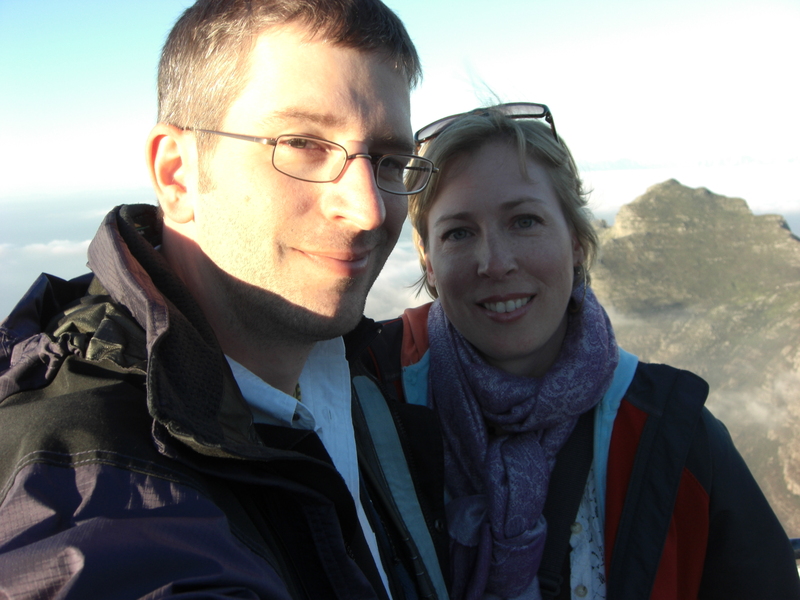 They’re from Rhodesia, now live in Cape Town, and work with us in Congo. 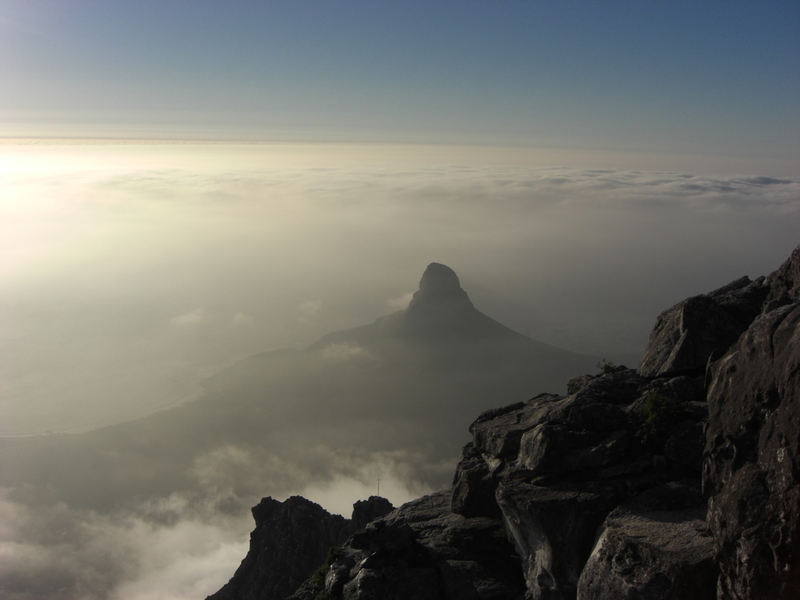 After lovely tea and nibbles, we told them how we hadn’t yet ascended Table Mountain, THE #1 thing to do in Cape Town, because of the weather. Only a few minutes later, Gerhard noticed that there was a break in the clouds, and he encouraged us to run out and try to catch the cable car. We made it just 10 minutes before closing time. 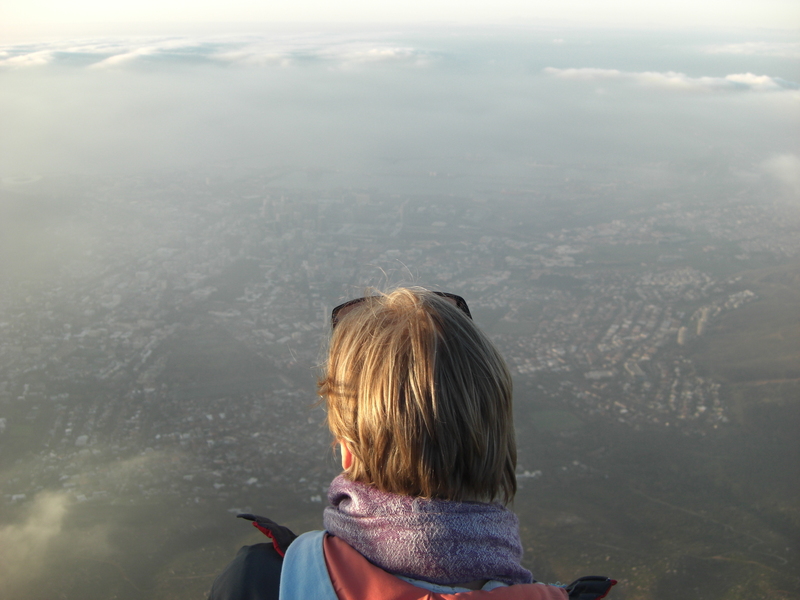 We ascended and discovered…. total beauty. Our procrastination paid off; I don’t think we could have timed it any better. The last remaining clouds made a nice tableau. A perfect end to a perfect 3 days in Cape Town. A couple things didn’t fit into the story but I wanted to add them as another plug for the hotel and the neighborhood: We really enjoyed two more restaurants in Tamboerskloof called Greens and Rick’s Café. The whole neighborhood is really great, and not on the tourist trail at all. The hotel (villa) was absolutely lovely, they even had free port and cake in the evenings! We had to park our rental car along the street outside, as the villa is just a house with no parking lot — which felt really strange, but we had no problems. Just can’t leave anything visible inside the car.